The topic of multi-homing the vCenter Server Appliance (VCSA) in which additional virtual network cards (vNICs) are added has been some what of an active topic of discussion lately, at least internally. By no means is this a new topic, in fact if you do a search online, you will find several articles on how to configure additional vNICs for older releases of the VCSA. Some of the common use cases for requiring this capability for the VCSA or any other infrastructure VM for that matter range from having a dedicated backup network, 3rd party monitoring and accessing the management stack through a bastion jump host which resides on the public side of a DMZ environment. Disclaimer: Although it is possible to add additional vNICs to the VCSA, as far as I have been told, this is currently not officially supported by VMware. Please use at your own risk. If you are considering multi-homing your VCSA 6.x (applies to vCenter Server 6.x for Windows), there are a few things to be aware of from earlier versions of vSphere. 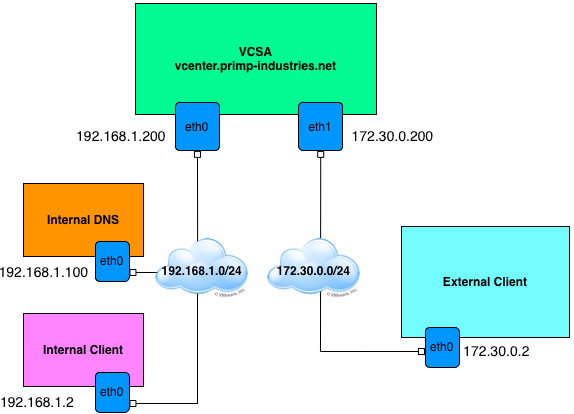 Before jumping into the details, lets take a look at an example deployment of the VCSA which has 2 vNICs and that is connected to two different networks. The first network is 192.168.1.0/24 which is connected to the first interface (eth0) of the VCSA. The VCSA's primary network identifier (PNID) is using the FQDN of the VCSA which is vcenter.primp-industries.net. We also have a DNS server and an internal Windows desktop client residing on this network which we will refer to as Network A. We then have a second network 172.30.0.0/24 which we will refer to as Network B which is connected to the second interface (eth1) of the VCSA. There is also a Windows desktop client residing on Network B. For the internal desktop client, I can point my browser to either the FQDN (vcenter.primp-industries.net) or the IP Address (192.168.1.200) and I can connect to the vSphere Web Client without any issues. The issue which some of you may have found in vSphere 6.x is that if you try to connect to the second IP Address (172.30.0.200) of the VCSA from the external desktop client, you will notice that a redirect occurs when the vSphere Web Client loads and you are taken to the SSO endpoint which fails to resolve as seen in the screenshot below. Once the change have been made, you simply just need to refresh the browser and as you can see from the screenshot below, I am now logged into the vSphere Web Client using the secondary IP Address of the VCSA. This is also another reason to always use an FQDN vs. IP Address which I discuss in more detail in the next section. Note: If you just want to access the vCenter Server using API or vSphere C# Client, you will not have to perform the tweak as neither of those interfaces require going through SSO. If you plan to use the vCloud Suite SDKs which do require SSO, then the tweaks mentioned above will be required. As you can see from the previous issue, if we had selected an IP Address instead of using the FQDN for the PNID, we would not have been able to access the vSphere Web Client even with our tweaks. The reason for this is that the PNID is now tied to the IP Address and you would not be able to resolve that address from the external desktop client. In addition to this issue, if you chose IP Address instead of FQDN, you will run into another problem with the default self-signed SSL Certificates which are bounded by either the FQDN or IP Address. If you do not plan to use your own certificates which you could add additional entries, then make sure to always use an FQDN. Make sure that you are using two completely different networks (e.g. different VLANs & different gateways) else you will run into problems with Linux IP reverse path filtering. If you really need to use the same network on both vNICs, then you will need to disable ip reverse path filtering. This is not a new issue and applies to all modern OSes as you can only have a single default gateway. If you do need to specify a second gateway for the additional vNIC, you have the option of either using a static route or creating a secondary routing table. Starting with VCSA 6.0 Update 1, there is now a new HTML5 based VAMI interface for managing and configuring the VCSA appliance. You can add a new vNIC to the VCSA while it is running using either the vSphere Web/C# Client which manages the VCSA. Once that operation has completed, you can login to the VAMI UI by opening a browser to https://[VCSA-HOSTNAME]:5480 and select the "Networking" tab on the left hand corner. You should see both vNICs, with the newly added vNIC in an un-configured state as shown in the screenshot below. To configure the new vNIC, just click on the "Edit" button and specify either an IPv4 or IPv6 address. Make sure you do not add a gateway UNLESS you plan on changing the system default gateway. You can potentially negatively impact the VCSA's networking if you did not mean to change the default gateway of the system. For those interested, I had used VMware Photon and the following Docker Container to quickly stand up a DNS Server. This might come in handy for anyone looking to try this out in their lab or just for general testing. Second vNic should be supported. It is really helpful to configure an isolate network where the Autodeploy with its associatte DHCP server is running. Would the multi-homed configuration be supported in the imminent release v6.5 of vCSA? Hello, could you show your network settings for this? 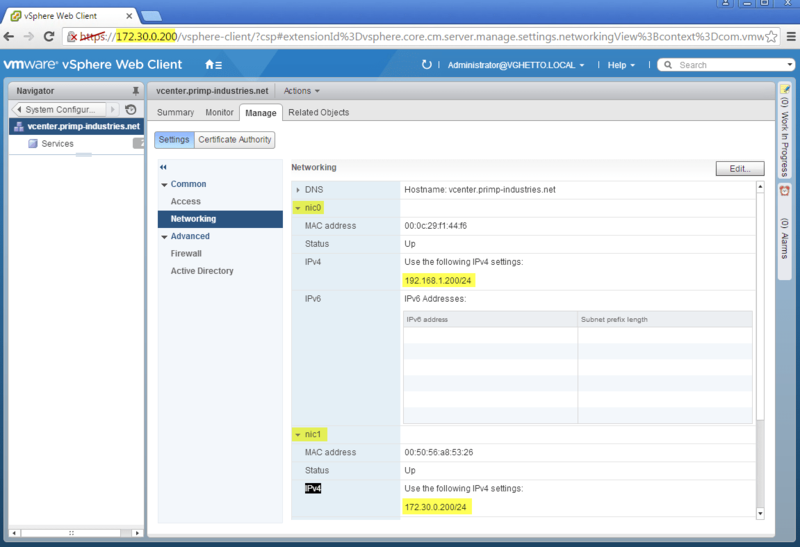 What if the vCenter was installed using an IP address (no DNS) and an External PSC. 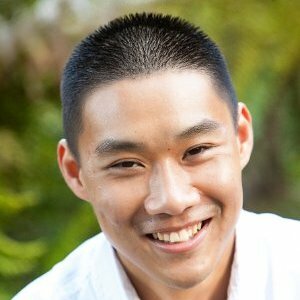 How would the DNS workaround work for that?